(CNN) - The football coach at a publicly funded charter school in Arizona has been suspended after directing a player to lead a team prayer. One side says it's a violation of the coach's religious liberty. The other says it's a violation of the players' rights to have a religion-free locker room. Watch the video above to see more. 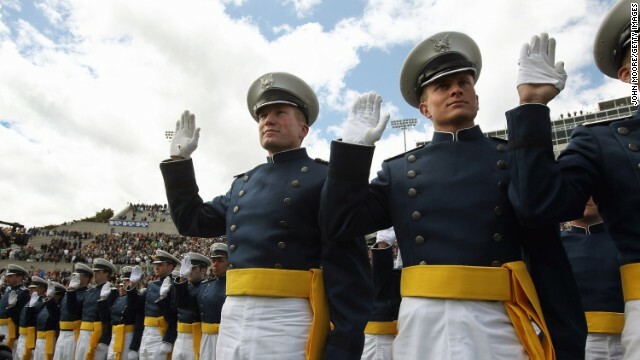 Cadets take the oath of office during a graduation ceremony at the U.S. Air Force Academy. (CNN) – The Air Force has reversed course again and will allow an atheist airman to omit the phrase "so help me God” from its oath, the military branch said Wednesday. “We are making the appropriate adjustments to ensure our Airmen's rights are protected,” Secretary of the Air Force Deborah Lee James said. Earlier, the Air Force said the unnamed airman would not be allowed to re-enlist unless he recited the entire oath, including the disputed "God" section. It was the latest religious controversy in the heavily Christian Air Force, but this particular issue has ancient and somewhat surprising roots: In the early days of Christianity, it was Christians who refused to swear by powers they didn’t believe in. The oath was written into law in 1956 and, like the Pledge of Allegiance, did not originally include any reference to God. The final sentence came into the text in 1962, just eight years after “under God” was added to the Pledge of Allegiance. Even then, however, it was not an absolute requirement in the Air Force: Official policy had stated that “Airmen may omit the words ‘so help me God,’ if desired for personal reasons.” But the lenient policy was updated and eliminated in 2013, leading to the most recent standoff, which Wednesday's announcement seemed to solve. "The Air Force will be updating the instructions for both enlisted and commissioned Airmen to reflect these changes in the coming weeks, but the policy change is effective now," the Air Force said. "Airmen who choose to omit the words 'So help me God' from enlistment and officer appointment oaths may do so." The repeated fights over the Air Force oath highlight the fraught relationship between faith groups and military service. But the NFL star's Christianity shouldn’t be missed or undervalued in the sharp debate about his actions. Those of us who grew up in conservative Christian churches know all too well the culture that shapes the parenting beliefs of people like Peterson. Today, the most notable proponents of spanking are American evangelicals. They not only preach the gospel of corporal punishment, they also impart messages that lay the foundations for abuses against children and the protection of such abuse by our legal system. We have books about spanking. Popular Christian talk shows promote the benefits of spanking. Pastors preach and theologize spanking. Organizations like Focus on the Family offer parents resources about how and when to spank. The ties between Christianity and corporal punishment are so strong that a large number of conservative Christians parents simple deny studies that suggest spanking does more harm than good. Now, I’m not saying that evangelical churches are to blame for what Peterson did to his son. But the church isn’t innocent in the matter, either. Without the church, the popularity of spanking would have dwindled. Stricter laws would probably be in place to protect the rights and livelihoods of children. And people like Peterson would not feel as though he has a license to do whatever he wants to his child. For decades, American evangelicals have fiercely fought any legal or cultural limits on parents’ “rights” to discipline their children. As a result, American children are some of the least protected people in the world. They are often innocent pawns to the vile disciplinarian doctrine of folks like Michael and Debi Pearl, pro-spanking theologians who suggest that corporal punishment should begin when a child is only 6 months old. But spanking theologies are not simply the teachings of Christian extremists. Wenzhou, China (CNN) - At a gray church on the outskirts of Wenzhou in eastern China, Christians from across the county keep a nervous watch. Some stand behind the iron gate; others sit just inside the church door. For more than two months they've waited, preparing themselves to protect the cross on top of their church. "If I have to, I am going to hold it in my arms and protect it," one elderly man says. "They have no right to tear it down, that is why we have to defend our church." Wenzhou is known as the "Jerusalem of China" and throughout this year the local Communist Party authorities have demolished scores of churches and forcibly removed more than 300 church crosses. Chinese church leaders say it's the worst anti-Christian crackdown in decades. "What the government here is doing is so barbaric, they're like bandits and we are furious with them," says Chen Zhi'ai, a respected church leader in the Wenzhou area. "Today we've seen the fundamental symbol of our faith violated and it hurts us deep inside our hearts."